Quando Oculeth te trava no ar, um botão de habilidade ativa (como o botão da guarnição) vai aparecer na sua tela. Precisa apertar o botão, por que se não você vai ser teleportado para o mar e vai precisar correr de volta para ele. E num é que ele me enviou para o fundo do mar mesmo. E, alias, fiquei preso lá. Algum bug sei la. Meu personagem não se movia, só ficava girando lá na água. Ainda bem que tinha Capacete das Profundezas na bag. Depois soltou sozinho, sem precisar relogar nem nada. When you reach the workshop, Oculeth threatens to teleport you to the Great Sea if you do not show him the coin. If you wait about 15 seconds, he actually will do so - you are teleported to the coordinates 47, 57 at the ocean floor, which is on the southwestern outskirts of Suramar City. Oculeth's Workshop is part of Noctívoro, mas não esquecido - Chief Telemancer Oculeth storyline. If you happen to just go by the map, and run the wrong way and die down in the big great city. Just release, and you will be at the workshop. The path to the workshop starts at 48.5,49.4. Chief Telemancer Oculeth says: That is far enough. Chief Telemancer Oculeth says: Well, you are not from the palace... and you are no demon, at least not entirely. Chief Telemancer Oculeth says: Identify yourself, before I teleport you to the depths of the Great Sea. Chief Telemancer Oculeth says: The sign of the dusk lily... This is the First Arcanist's seal! Is she alive? Chief Telemancer Oculeth says: Then there is still a chance... Come quickly! I need your help. Chief Telemancer Oculeth says: Right. The trap. Chief Telemancer Oculeth says: N'eth ana! I appreciated the "at least not entirely" as a Draenei. 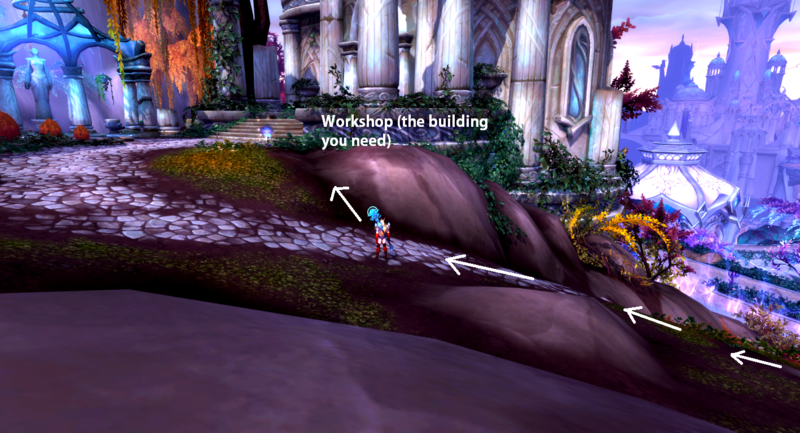 You do not need to go through the city to reach his workshop; when you're near the city but still outside it (~46, 50 at Suramar), there will be a river to your left; across the river is a road leading up a hill to the workshop. When I showed the coin, I expected the debuff to go away shortly, as with all "rooted" moments. And then he came back and exclaimed: "Ah! The trap!" I laughed as he unloosened me. Nice touch, Blizzard! just to be clear if your not paying attention after he talks to you.....if you dont show him that stupid coin fast enough....HE TELEPORTS YOU TO THE MIDDLE OF THE OCEAN and all the way across the map.....yeah hes not trolling you he WILL do it. 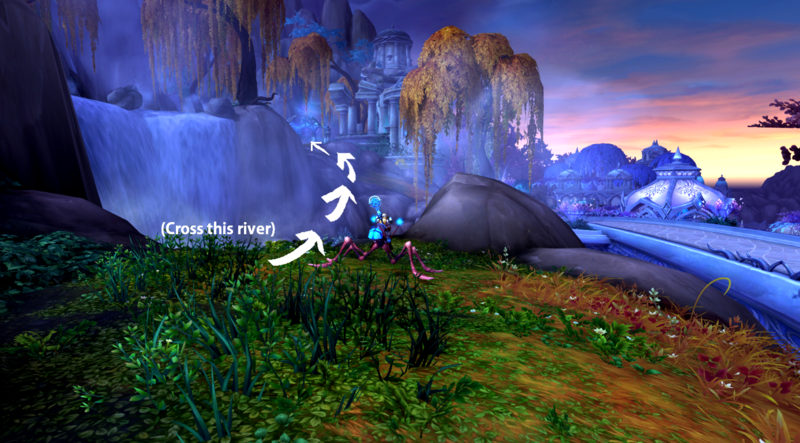 Hope you have waterwalking or Whistle >.> Not going to lie, I was distracted IRL and really pissed when I saw where I was! Using the quest item makes a 'ding' sound and makes your arms do a silly dance, at least if you're a Blood Elf female. Wish I could keep it! At 49,48 in a temple-like building. A purplish flag is visible from the outside. If you happen to fall to the lower part of the city, the teleport to the higher part is at 46.5, 50.2. This is on the level above the city ("ground level", the city goes down below ground). If you find yourself in a place called The Menagerie you need to run quite a long way back out and find your way out of the city again. %^&* whoever came up with the idea of teleporting the player into the middle of the %^&*ing ocean. He earns my vote for biggest troll in WoW. God help me if I had the ability to teleport someone to the bottom of the Great Sea that macro button would definitely be broken by now. You can find Chefe Telemante Oculeth in a tower at 49 48 point, when you enter, there's a trap activates, then Chefe Telemante Oculeth appears and asks who the hell you are. Show him Moeda da Primeira Arcanista and you'll have a talk, else he will teleport you off under the sea. You get nothing, like an achievement, by letting him teleport you and he sends you pretty far away. He also won't say anything new if you're ported and come back. In other words just show him the coin. 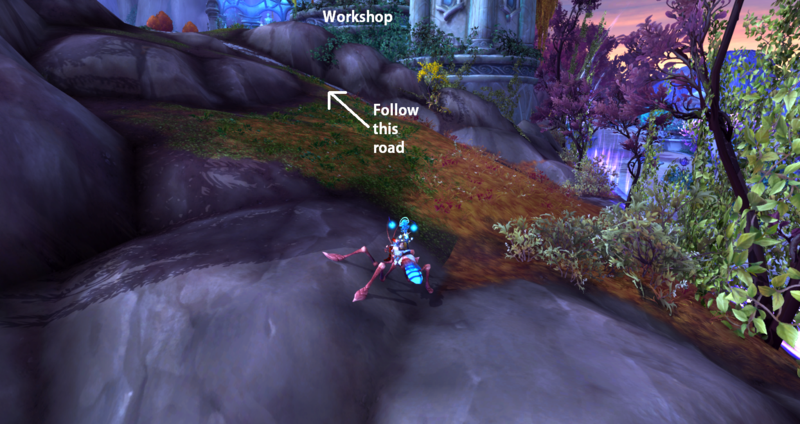 If you cant get to Oculeth's, just attack some mobs and kill yourself near the place marked in the minimap. You will be teleported to the right place, with no penalty. In case you're wondering, he's not kidding with that threat to send you to the bottom of the Great Sea. Turns out that was a bad time to alt-tab. He isn't kidding, he will teleport you to the middle of the sea under Dal and you will drown if you afk'd in his trap like I did LOL! You need to go inside the temple at 49,47. He won't appear until you enter. Here are the beacons to hit for the quest "The Delicate Art of Telemancy". Realize that the Garden and the Fountain are just necessary transit stops with nothing to do there. 1. @ the Workshop, use the Yellow beacon ( to the Garden), the only functioning one. 2. @ the Garden, use the Purple beacon (to the Fountain). 3. @ the Fountain, use the Purple beacon (to Telemetry Lab). Go kill things and pick up your item. 3. @ the Telemetry Lab when leaving, use the Purple beacon (to the Fountain). 4. @ at the Fountain use the Blue beacon (to the Garden). 5. @ the Garden, use the Green beacon (to the Warp Lab). Go kill things and pick up your item. 6. @ the Warp Lab when leaving, use the Purple beacon, the only one available there, and the only beacon going back to Oculeth's Workshop. Yellow > Purple > Purple > Purple > Blue > Green > Purple. OR, Workshop > Garden > Fountain > Telemetry Lab > Fountain > Garden > Warp Lab > Workshop. Well, he really sent me to the very bottom of the sea. And, alas, I got stuck there. Some bug I don,t know. My character was not able to move, just kept spinning in the water. Good thing I had the Capacete das Profundezas in the bag. Then he released himself, without having to relog or anything. Dê a Moeda da Primeira Arcanista para o Chefe Telemante Oculeth. Você pode me entregar para Thalyssra depois que meu trabalho aqui estiver terminado.